I'm trying to program an ESP8266 ESP-01 module to let it connect to my personal wifi network and activate a wireless relay that I've bought. No problems with Wifi connection so I've omitted the code about it, my problem is to find what is the right PIN to set to LOW/HIGH to control my relay. Setting relayPin to 1 as shown in this code works and with it I can see the embedded LED turning on and off. I've tried to set relayPin to 0 or to 2 but the relay doesn't activate/deactivate. So, what is the right PIN number to set in my relayPin constant to control the GPIO0 port? The relay works succesfully if I give him +3.3V on GPIO0 with an external power. 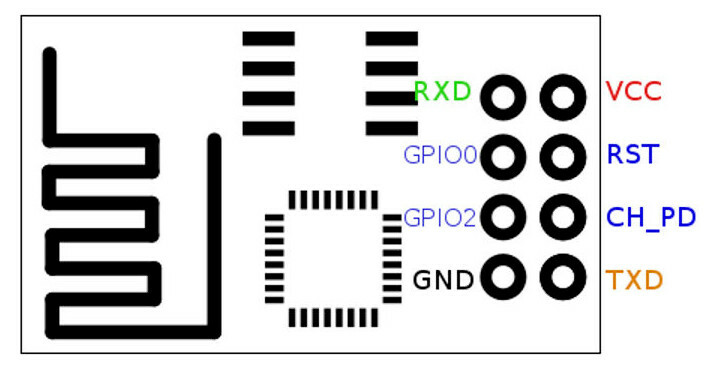 Looking at better pictures of the PCB on ALIExpress it looks like GPIO0 is used to switch the relay. What that pin maps to, though, depends on what board you have selected in the IDE. Need to short the GPIO 0 and GPIO 3(Rx) pin on the relay board. While inserting the ESP-01, either bend the GPIO 0 or completely remove it from ESP-01 board. Be careful, on removing you wil find difficult to program the ESP-01 module again because GPIO 0 should go low at boot time to enable program mode. And this is the reason why GPIO 0 is HIGH on boot. Not the answer you're looking for? Browse other questions tagged esp8266 relay or ask your own question.